【植物, 植物学】 ルリジサ 《ヨーロッパ産の蜜源植物; 香味料やサラダ用》. Borrowed from Old French borage (compare French bourrache), from Medieval Latin borrago, either from Latin borra (“short wool, rough hair”) or Arabic أَبُو مِن العَرَق‎ (ʾabū min al-ʿaraq, literally “father of sweat”). 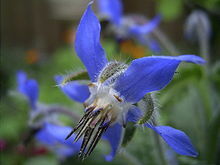 Borago officinalis, a Mediterranean plant with rough, cucumber-flavored leaves, used in salads.